Greetings, children of the Internets! Mozilla is about to unleash their fourth major release of Firefox, the highly popular web browser that has started the revolution and torn the supremacy away from Internet Explorer. Since, the Web has become a rich battlefield, with new browsing coming out, better, smarter, faster, and more elegant. 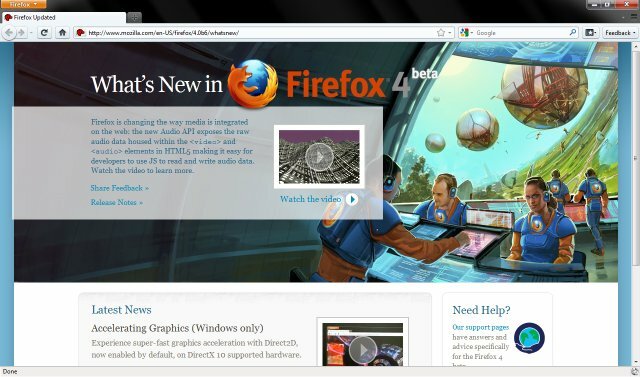 With Google Chrome nipping tightly at its heels, Firefox version 4 must make a great impression. It's all about user experience. It's all about speed. And even though some of the hype may be overrated, hence the term, hype, it's irrelevant any longer. People want bling bling and they want warp speed. To let you know what you're up against, I decided to take the latest beta for an early spin. This preview will tell you how good Firefox 4 is really going to be and whether you should start salivating now - or writing an obituary. Or something else entirely. So follow me for a spin. 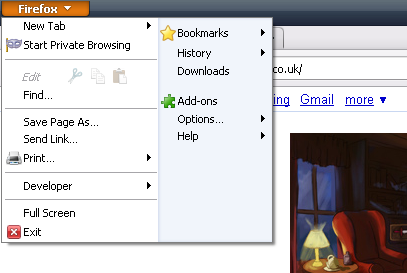 Firefox 4 offers lots of new stuff. You will like some, you will dislike some. Whatever your taste, inclination or religious orientation may be, Firefox 4 brings a whole lot of changes, some quite new and radical, others more conservative, others merely an extension of popular and populistic trends. So let's take a look. Installation is trivial, like before. 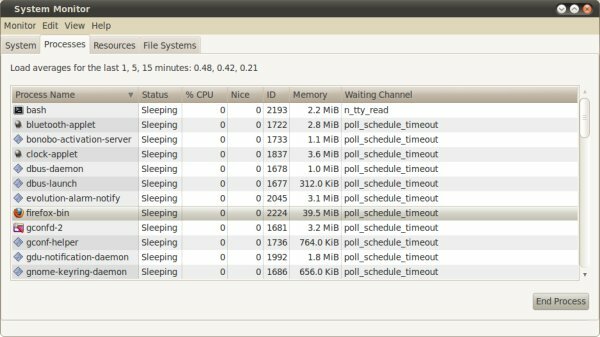 Whether you decide to test on Windows or Linux, it's quick and simple. 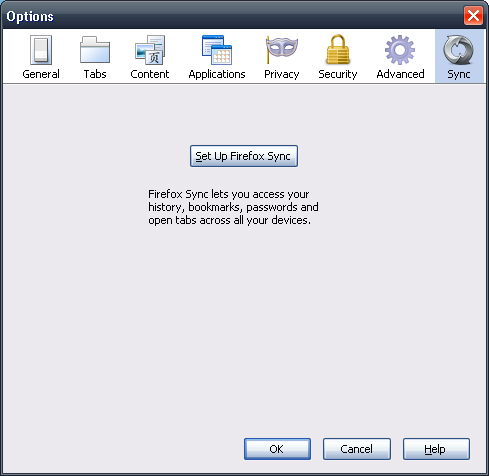 You can have Firefox 4 installed alongside your existing earlier version. The profile will be shared, but most of the plugins, extensions and themes won't work in the beta yet. Now, how will Firefox look when you open it? Well, that depends on your profile. If you already have one, your old looks will be retained. 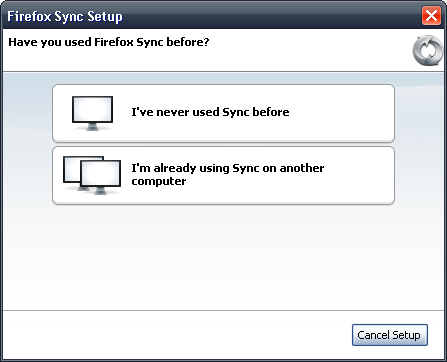 But this is only important because of one special new feature that comes with Firefox 4. That of tabs on top. Sounds like a Duran Duran song. This probably is the hottest, most controversial and definitely populistic change. 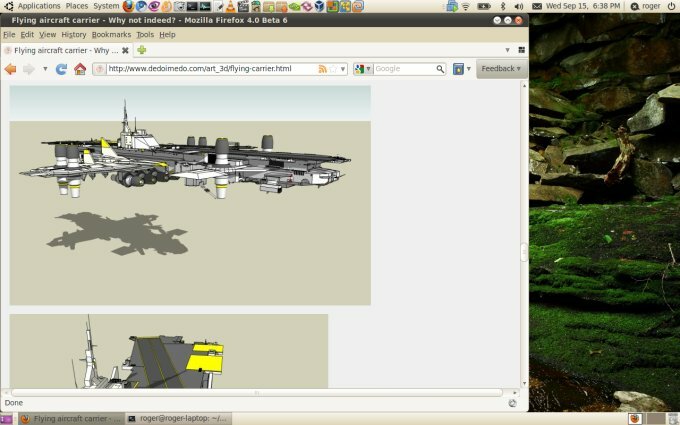 Firefox 4 ships with tabs shifted above the basic page icons. 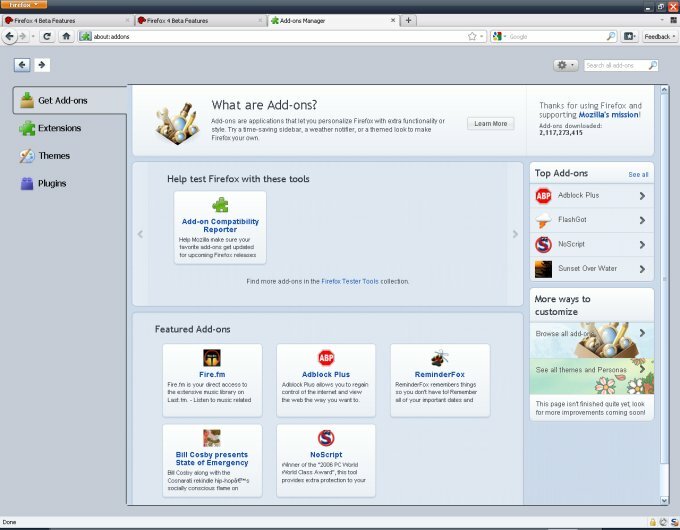 This has already been implemented in Opera and Chrome, and now, Firefox follows suit. In Linux, things are a little different. You can have tabs on top or bottom, but the file menu is there, so the new look is muted down. Of course, with the majority of desktops running Windows, it's obvious that Mozilla seeks for a critical impact on the Microsoft platforms. Linux will follow suit later. But do not despair! It will happen. 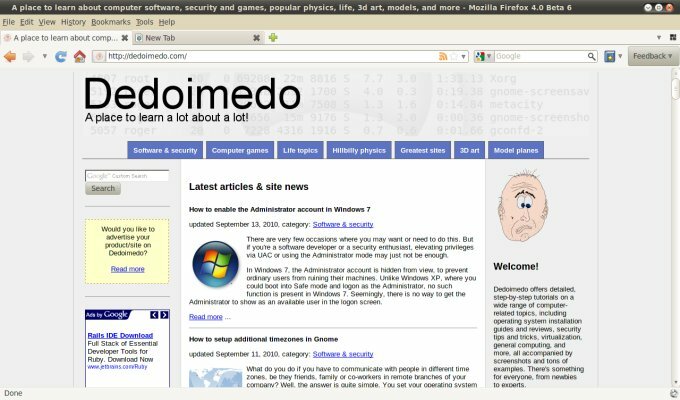 In fact, even today, with a bit of tweaking and the use of some smart themes, you can make the current version of Firefox look every bit dash and posh as the upcoming release. So there's hope - and quite a bit of customization. 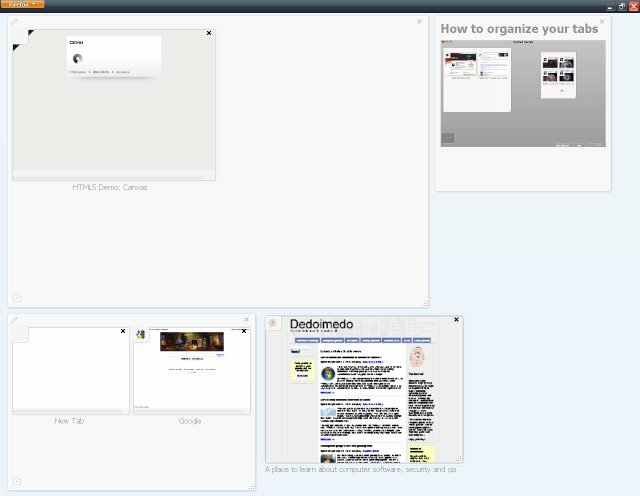 Some mockups of how things can be like, using a handful of themes and extensions currently available for Firefox 3.6. Throw in the tabs on top and you're as good as new. Now, if you have a profile configured already, things will look the way they always did, with file menu seen or hidden, based on your preference, and tabs position unchanged. Therefore, if you fear the new look, don't. Likewise, switching back and forth takes exactly four seconds. Here, the integration is not quite as successful as you may expect. Now, partly, the reason could be the specific Windows 7 theme used, but you get partially shaded buttons and a sort of an artsy smear of color surrounding the window title and the file menu. I can see how people may not like this kind of looks. Overall, tabs on top is okay, but the concept feels geared toward younger people. Now, if you ask me, the whole tabs on top thingie is just a sensation, like Facebook. But you can't stop it, and no one knows why tabs on top came to be and what makes them holier than holy water. If you go for the tabs on top, no classic file menu, then you get a brand new magic orange button in the top left corner, which lets you do all of the usual stuff. It looks rather charming, both on Windows XP and Windows 7. 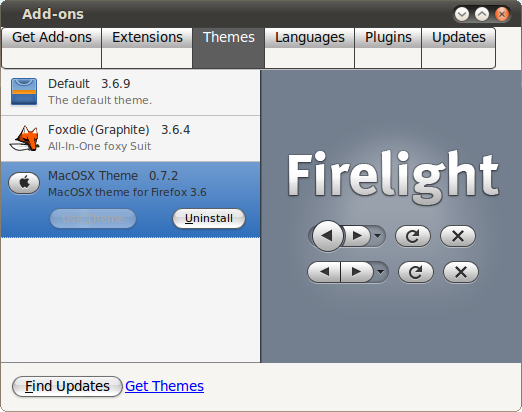 No such fancy for Linux people yet, I'm afraid, without special themes and tweaks. 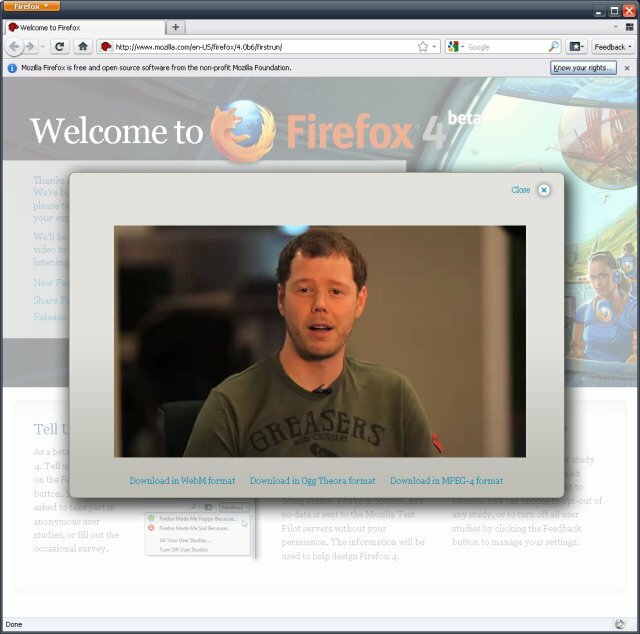 Firefox 4 lets you backup your browser to a remote server. The idea is similar to using backup extensions like FEBE, only you get an offsite, online backup. Quite useful for the average guy. Just click the gray fox icon in the bottom bar. Or go into the options, as usual. HTML5 is the new buzz world. It's the old web, infused with multimedia elements, allowing you to embed fancy audio, video and rich applications into web pages with minimal coding fuss. It looks great and works well. 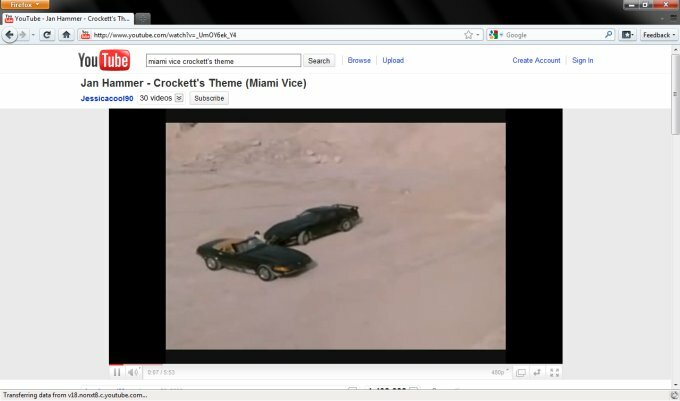 But then it also works fine on Firefox 3.6. Another interesting feature. Click the grid-like icon in the top right corner and you get a sort of a canvas, where you can shuffle tabs into separate groups. This will effectively reduce the tab clutter on your screen, allowing you to work with small collections of similar items at any one time, even though they are all open. This might reduce stress and increase productivity. It definitely can help you organize your work. Plus, it's fun. It looks better now, more accessible to ordinary people. Still, most of the stuff does not work for Firefox beta, so you will have to wait for the official release to really get to enjoy the new simplified interface. Speaking of plugins, things didn't go smoothly. 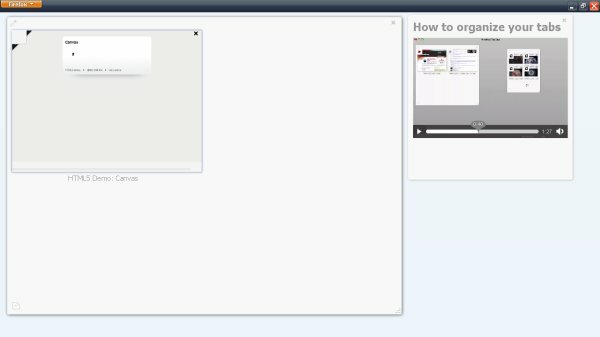 On Windows, Youtube worked fine, but on Linux, both openSUSE and Ubuntu, Firefox 4 refused to work with the Flash plugin. We can't blame the beta, but still, food for thought. 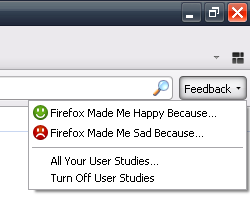 You can also submit feedback on your work with Firefox. Ht the feedback button and choose the relevant action - happy or sad. This function should let you vent your anger as well as provide the developers and marketing people with the right kind of information about their work. So if you don't like something, shout! On Windows machines, you will get hardware acceleration whenever possible, so intensive graphic activities should take very little time. You will also offload your CPU to more important tasks. Ideal for games like Quake Live. 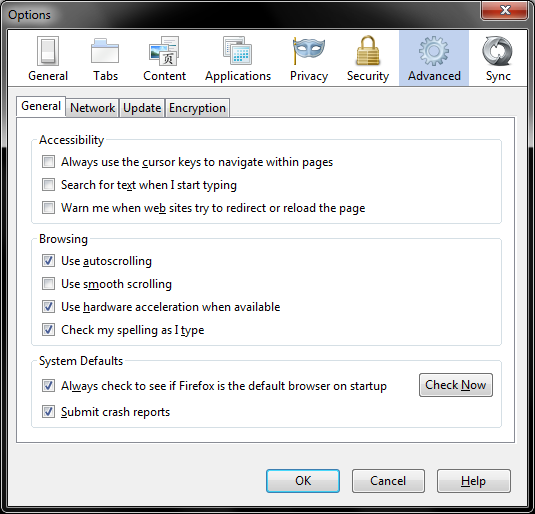 Now, the upcoming Internet Explorer 9, which is only going to be available for Windows 7 and suchlike, leaves a huge market gap that Firefox fills nicely in this regard, since it supports the entire range of Windows operating systems. Call it a gift from Microsoft. Speed wise, Firefox 4 is approx. 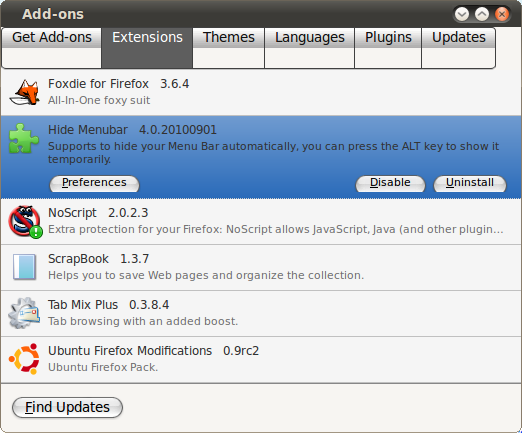 the same as Firefox 3.6, with more improvements to come. The rendering engine is more optimized, but you won't notice any big difference. However, the responsiveness has improved immensely. Firefox 4 FEELS much faster. The in-browser activity is animated in such a way to give a perception of blitz speed, the same they did in Chrome. This makes itchy, impatient users happy. It's good. Very good. 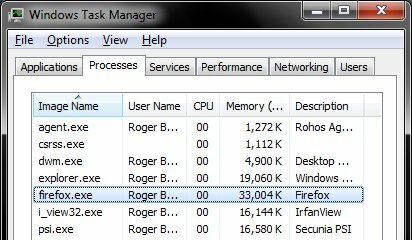 Firefox 4 uses approx. the same resources like its predecessor, on all systems. The usage for a single tab is approx. 35-40MB steady, as expected. 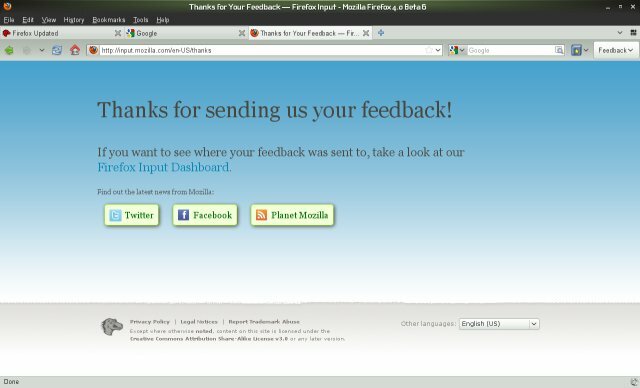 I've tested Firefox on Windows XP, Windows 7, Ubuntu Lucid and openSUSE 11.2, and it works superbly in all cases. There were no weird bugs, errors or glitches, except that most extensions, themes and plugins are incompatible with Firefox 4. But this should not be a problem, since it never has been with official releases. 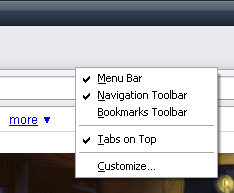 I think Firefox 4 is a very smart product. It looks better than 3.6 overall, tabs on top or without them, it feels faster, it has lots of useful features, and it's got the Web 2.0 bling bling. 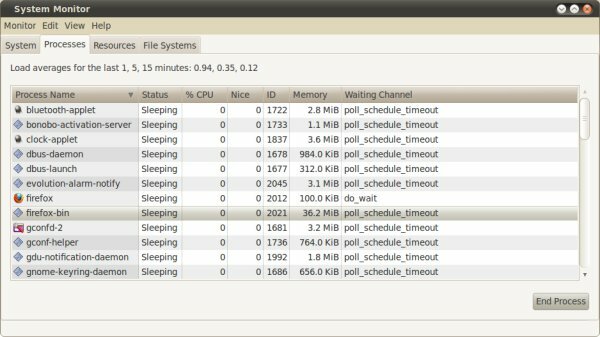 Linux beta lags a step behind, but that's understandable. Performance is good in all aspects, with major improvements in responsiveness. Memory consumption is fairly modest. 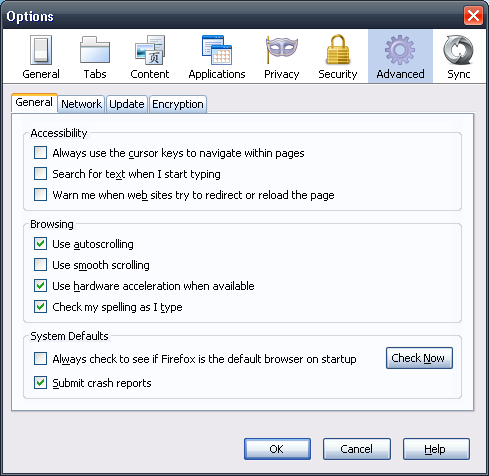 Firefox 4 is a pleasant addition to the browser arsenal. Tomorrow, I'm going to test the new Internet Explorer 9 beta. And then, put the two, head to head.